Manchester Center, VT – January 10, 2014 - For the past six years, Digital Wish has been studying the process of implementing one-computer-per-child programs in Vermont and New Hampshire schools, as well as teaching Digital Citizenship across 50 sites. As a non-profit on a mission to bring technology to American classrooms, trainers have spent years delivering computers, weekly educator and student trainings, a complete IT curriculum, and support to schools across Vermont and New Hampshire. In addition, the Digital Citizenship training reached a major milestone spanning 50 schools in VT, NH, NY, and CA. The gem of the program is clearly the Digital Citizenship unit, which raised student understanding from 26% to 96% in just 3 class periods. Read the research: http://bit.ly/19eGWHj. The data clearly demonstrates the need for wide scale training on digital citizenship. 20% of the schools we enter already have a student in trouble for a safety infraction. 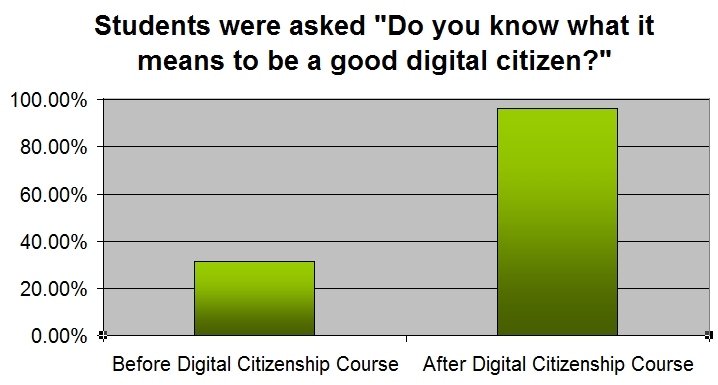 74% of students answered "No" when asked "Do you know what it means to be a good digital citizen?" As a result, the next phase of the program will center on development of a self-paced curriculum for digital citizenship that be leveled for elementary, middle, high school, and businesses. Beginning in 2008, Digital Wish embarked on a year-long academic study to research successful and failed 1:1 computing initiatives. This intensive research period resulted in the identification of eight essential components which must be addressed in order to build a sustainable 21st century learning program, including leadership, investment, hardware, connectivity, training, curriculum, IT support, and community engagement. The team discovered the absence of even one component creates a much higher risk of new initiatives failing downstream. 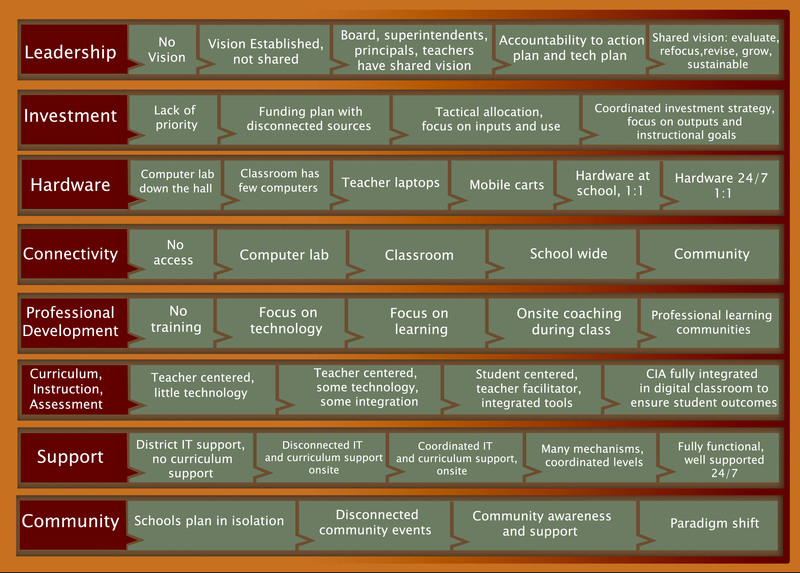 Early data demonstrated the importance of making one-device-per-child strategies a top priority for schools. Through these early pilot stages, Digital Wish gathered the resources and support necessary to scale the initiative. According to Heather Chirtea, Digital Wish’s Executive Director, “It’s extraordinarily difficult to develop a successful technology initiative from scratch because there are just so many decision points. Every school we entered in the pilot phase was facing the same issues, making the same kinds of decisions, and making the same mistakes in isolation. It was an incredible waste of time and resources. We’ve implemented so many sites now, that we can explain the downstream ramifications of nearly every decision and prevent schools from taking a wrong turn very early in the process. These lessons can be easily scaled across the state and the country.” In fact, many schools now ask Digital Wish to consult and help them through planning their technology programs. In partnership with the Vermont Council on Rural Development, Microsoft, Dell, and many others, Digital Wish was awarded $1.125 million in stimulus funding to implement their School Modernization Initiative across 24 more schools through the e-Vermont Community Broadband Project. The trainers constructed seven curriculum units based on the NETS technology standards. Digital Wish teachers entered 24 schools to teach both educators and students how to safely and efficiently use current technologies to learn and demonstrate their knowledge. “The first site took eighteen months of planning from our first contact with the school, to passing out computers in the classroom,” said Heather Chirtea, Executive Director of Digital Wish. “Our 30th deployment reduced the entire planning process down to just four weeks! We have systematized everything possible from press releases, parent letters, and policy documents to curriculum.” These curriculum units are now available nationally as individual units, or as part of the Digital Wish’s IT Curriculum Series. Workforce Prep - 93% of students say having technology in school is important in preparing them for the future. Importance - 90% of students say that it is important to their education to have their own computer during the school year. 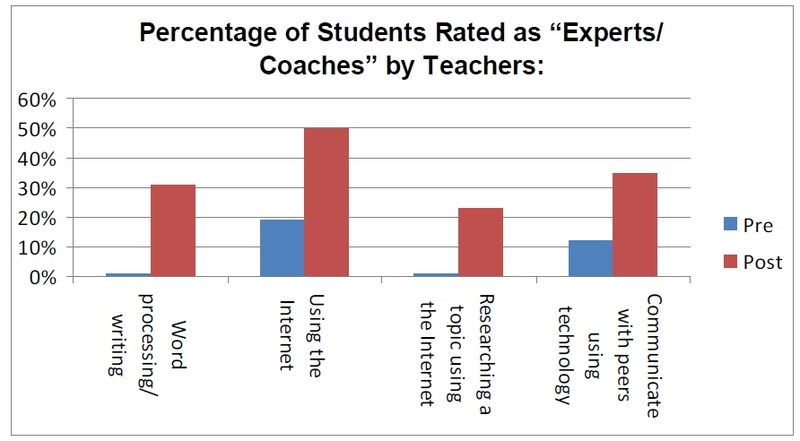 Skills - Teachers say that less than half as many students are considered beginners with computers. They consider approximately 1/3 more students to be advanced computer users. College - Students who plan to go to college increased from 89.1% to 90.7%, a 1.6% increase. Students take better care of equipment. Computer breakage rates are lower. Behavioral infractions have been significantly reduced. Some of the largest gains have been made by low-achieving students. The replication phase included 12 schools from the implementation phase as well as 1-2 new school added annually in an urban environment in Nashua, NH funded by a grant from Dell Powering the Possible. The same resources that were developed during the implementation phase were then used to replicate the program the following year. Ethical and Legal Issues - When asked to rate their understanding of the ethical and legal issues involved in copyright, 67% of students responded that they are now an expert. Prior to the 1:1 Initiative, 62% said that they did NOT understand copyright issues at all. Media Awareness - Prior to Digital Citizenship, 20% of students had no idea what types of media they could not access online. 78% now consider themselves experts. Increasing Intent to Attend College - The number of students who were NOT planning on attending college dropped from 6.8% to 4.3%, over the school year. Increased Problem Solving - 51% of students have participated in 10+ hours of technology projects where they had to solve a problem, gather information, or draw a conclusion. The previous year, 38% of students said that they participated in NONE of these technology projects. Engagement - 73% of students prefer to use a computer to do their schoolwork, and 89% say using a computer makes schoolwork easier. 86% of students enjoy school more when they use technology, and 73% enjoy school more when their teacher uses technology to teach lessons. Rising Engagement - 100% of the teachers surveyed report that they and their students are very enthusiastic about the Digital Wish Program. Teachers report that students are three times more highly engaged when creating digital artwork, word processing, and creating presentations than before Digital Wish’s 1:1 Initiative. The greatest changes in engagement were for creating presentations and writing. Increasing Comfort - Teachers are now twice as comfortable using technology to produce videos, create and give presentations, and create digital artwork, learning to use a new form of technology, learning to use a new computer program, and redesigning a lesson plan so that it integrates technology. Decreasing Behavioral Infractions - 100% of teachers report that they only need to send students out of their classroom for disruptive behavior 0-1 times per week, as opposed to 4-5 times pre-initiative. With one-computer-per-child initiatives implemented across 28 sites in 2 states the trainers began noticing a cultural shift taking place in the schools. Staff, administrators, and community members were rapidly shifting their assumptions about the need for technology in classrooms. Computers were no longer something that “someone else” had to deal with. Instead, they became an assumed part of every learning experience. In a post-mortem evaluation of the original 2009-2010 pilot schools, all of them had scaled up their technology programs within 12 months of Digital Wish’s arrival. One town voted to increase their school’s technology budget from $5,000 to $50,000 in the following school year – ten times their amount originally allotted for educational technology. “Technology is important; its importance will only increase in the future. Almost everyone has a job that involves at least typing or researching things on the computer. In addition to classroom training during the school day, 196 students from 11 of the 13 replication schools participated in after school programs on computer programming. High school students and even Dell employees acted as mentors to elementary school students to help them create video games using Microsoft Kodu and Expression Web. In addition, the Digital Wish after-school program was supplemented by field trips to Dell and onsite career-exploration. The corporate engagement brought a "real world" interface to the initiative that simply couldn't be taught in the conventional classroom. After listening to a diverse array of executives talk about their different jobs Digital Wish trainers heard many comments like, "I'm going to work at Dell when I get older!" In one school only 7% of students even understood Digital Citizenship at the start of the program. The data was clearly demonstrating that the wide scale lack of understanding of digital citizenship concepts was at crisis levels. So Digital Wish expanded just the Digital Citizenship curriculum to 14 more schools in Vermont and New Hampshire. The result was immediate, comprehensive, and achieved near 100% proficiency. Chirtea continued, “The whole team was stunned when we saw these data improvements. Understanding of Digital Citizenship went up from 26% to 96%, and we were able to replicate that success across 14 schools in just 3 class periods.” Read the Nashua report. In the 2015-16 school year - Digital Wish will pursue grants to expand the digital citizenship training course for nationwide scale. Initial funding has already been secured to develop a digital citizenship "certification" curriculum for middle school students. Essentially, students have to pass the 3-hour course in order to be allowed to add their personal device to the school's internet network (enabling "Bring Your Own Device"). The course enables schools to allow hundreds of student-owned devices onto their networks, and dramatically increases internet access in the classroom environment for students. At the same time, BYOD reduces the school's cost of hardware purchases necessary to ensure information access for every child in learning. According to Chirtea "We're envisioning a certification course for Digital Citizenship that can be scaled. It will not only make the internet safer for kids, but it will solve the lack-of-internet-access problem in classrooms, and at the same time take a big bite out of the hardware shortfall in schools. Schools won't have to buy a device for every student, because frankly, most kids would rather use their own devices."